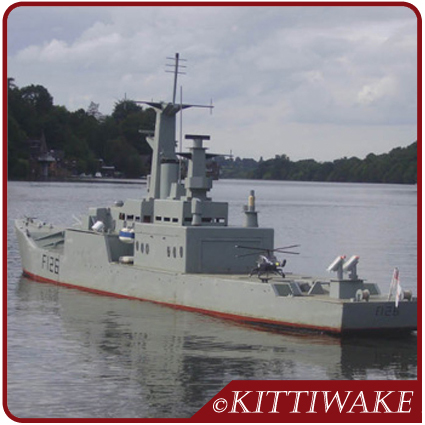 This is the most recent model, based on the frigate that took the surrender in the Falklands war. It is of the same dimensions as the battleship ie; 24ft x 3ft, and built in three sections. However, this model has much more space inside, as it uses the full width and height to accomodate the two crew. Seating is comfortable and visibility is good all-round. The older Type-12 has seperate lifting lids, but in a similar more modern design like the Leander class frigate, this can have a single hinged lid. This makes things easier in the build, and more practical to use. This is a very pretty hull as it has different deck levels, and even a helicopter and hanger on the aft deck. If you're really clever you could fly a radio controlled helicopter from the deck. The propulsion and steering mechanism is the same as the battleship, and handling much the same. The all up weight is approx 70kgs. Hire Roger and his fleet for £300 per model per day. Discounts for multiple days and/or models.